It’s about a 90-minute drive up to the reservoir and, as usual, we had not made an early start so we stopped en route for a picnic lunch before hitting the walking trails. We found a delightful picnic area beside a river babbling its way down the mountain. Half way through my sandwich I glanced at a white butterfly feeding on some nearby flowers. I really only glanced at it because I was keeping an eye out for those elusive Apollos. This, of course, was not an Apollo but it did look unusual, not your ubiquitous Large White. The underside of the wings sported a fine tracery of black lines. 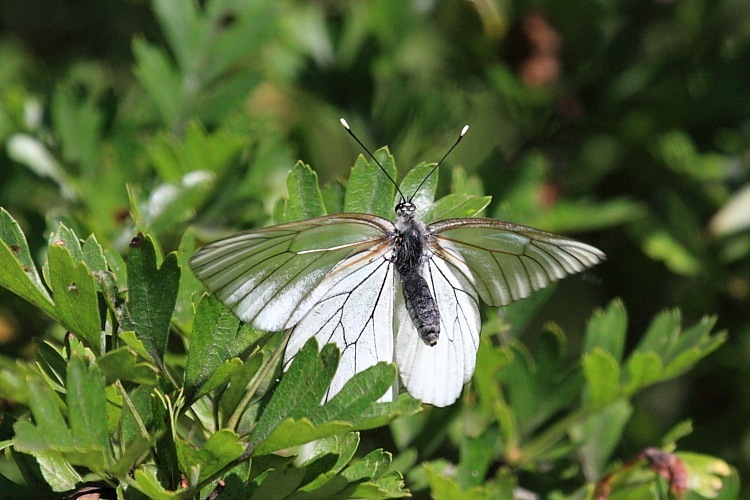 Vague recollections of something called a Black-veined White surfaced. Butterfly hunting trumps hunger so I exchanged my half sandwich for a whole camera and bounded off to try and snag the delightful creature on pixels. 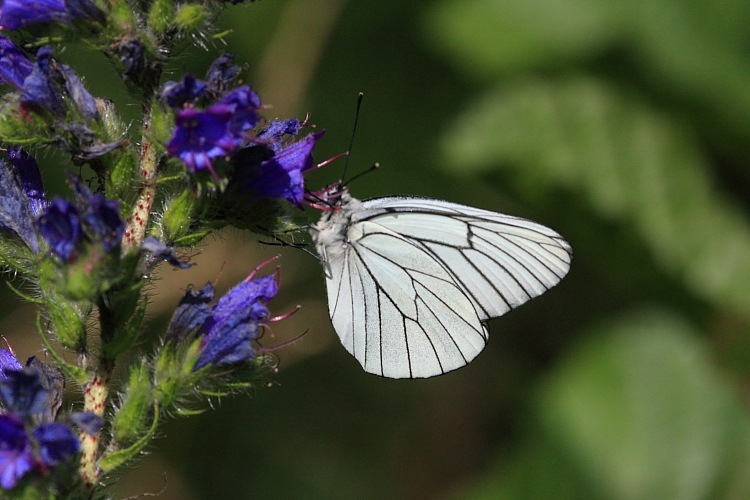 As usual with whites, the Black-veined White (Aporia crataegi) tends to rest with its wings closed. Not so much of a problem because the underside and topsides match. However, I did manage to get a shot of the topsides as it spread its wings and took off. Freezing a butterfly at take off shows a little of the interesting contortions they go through flying. This also shows the forewings looking near transparent in places so this may be a female – it’s supposedly the females that exhibit this feature. A reasonably successful first encounter. 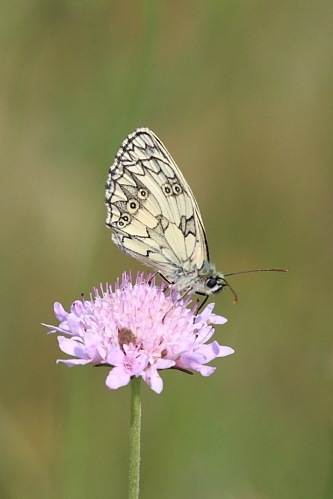 France is seething with Marbled Whites (Melanargia galathea) so I’ve watched thousands of them flitting about but I hadn’t yet grabbed a decent picture of one; again, generally because they sit with their wings closed. This time I found one that was periodically opening its wings as it fed – well, half-opening, at least. 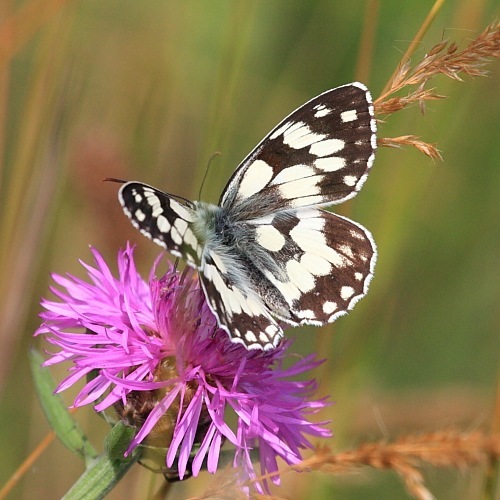 While I was clicking away, though, I did take the underside and only when I looked later did I realize how attractively marked the underside of a Marbled White actually is. Regrettably still no Apollo but these guys will shortly be added to my butterfly web album/catalogue.